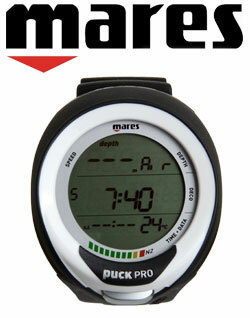 The Puck Pro Plus is an intuitive, fully featured value dive computer from Mares. The larger screen design is slightly wider than the original Puck for maximum readability, but now has a thinner design and sits in a more streamlined position on the wrist. The mineral tempered glass has superior scratch resistance and will improve display clarity in any condition or viewing angle. All functions are accessed through the intelligent single button, which include Nitrox up to 99% and Multiple Gas Mixture Scheduler. The firmware is also user upgradeable, allowing the Puck Pro Plus to be kept up to date for many years of diving.